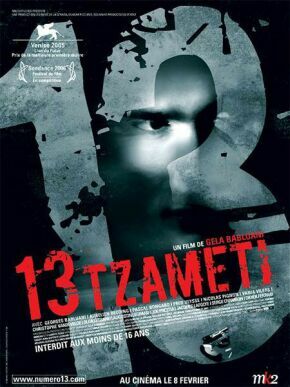 13 Tzameti is the calmest, most calculatedly-passive violent film I have ever seen. A Georgian-French co-production directed by Gela Babluani, and starring his brother George Babluani, this bleak black and white film is affecting in a sly, almost underhanded, way. This is helped by the fact that, although it was shot in 2006, 13 Tzameti could have been, from the mood and framing of the scenes, made in 1956. It gives a new meaning to the word timeless. Filmed somewhat crudely, 13 Tzameti has a paucity, and a miry understated flavour. The seemingly straightforward drama is laced with a sinisterness that can’t quite be excused. I’d even go so far as to say there is a Nosferatu feel (a feat in itself, given that Nosferatu was filmed in 1922). This puts the recipient of this steely story on notice as the plot develops on slow boil. But, subtler than the vampire movie, 13 Tzameti offers little clues as to what is in store from its slow and ‘downward’ beginning. Striking in its unfolding, the film opens up like an electric shock to the brain. So, after making sure it’s the original (there was an American remake in 2010) it is best to see this movie before you read anything else about it. 13 Tzameti is, after all, a film (like most in my view) best served cold.